Every year around this changeover of seasons my skin seems to have a bit of a paddy. It always really misses the sun and this year it's had to get used to less sleep because of my longer commute and general London life too. I'm lucky that I've never suffered from real problem skin, but since Autumn hit it's all got a bit too bumpy and congested for my liking... cue REN coming to the rescue! 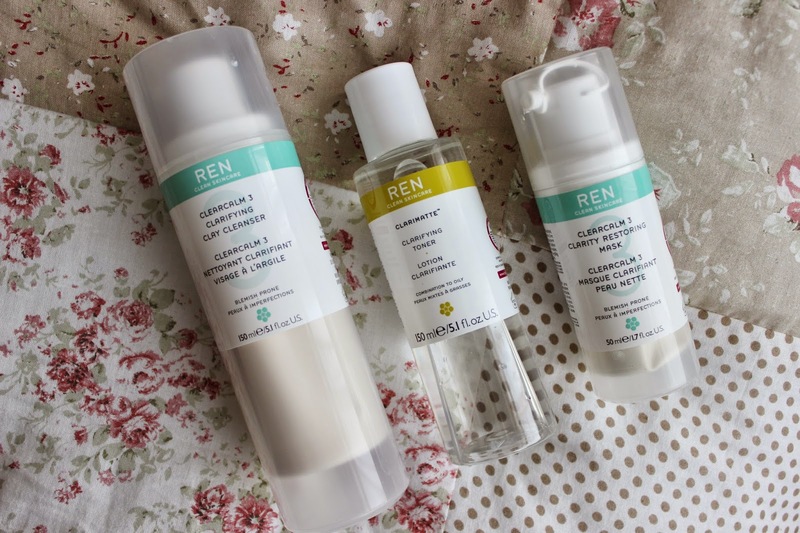 Having only tried the radiance range from REN, I decided to invest in some more skin sorting products- the Clarimatte Clarifying Toner, ClearCalm Clarifying Clay Cleanser and ClearCalm Clarity Restoring Mask. So far I've been using the cleanser in my morning routine, the toner before I go to bed and mask once/twice a week and have noticed really good, steady results so that my skin is pretty much restored to normality. Hoorah! The first thing I love about REN is how simple and straightforward their skincare is- it either works with cotton pads or water (no extra cloths/buffers involved) and you are told exactly what the product is and when to use it. The product I've enjoyed using the most has to be the cleanser. Most blemish fighting cleansers are harsh and strip the skin, but this lathers up to a gorgeous creamy consistency that soothes the skin, leaving it clean, calm and under control with a comforting layer of moisture. As you can imagine the mask is a bit more drying, but actually manages to both unclog pores and stop spots in their tracks which usually you have to buy two separate masks for. It also helps to reduce the appearance of spot scarring, making this a perfect all in one mask for complexion perfection. Now onto the toner- this is unlike any toner I've used before. For a start it actually earns it's place in my night time routine by being incredibly effective at smoothing and resurfacing the skin (goodbye pesky underskin bumps!). It also lifts excess makeup that your Bioderma didn't quite see to and gives you a very satisfying skin tingling effect. Obviously REN isn't a budget brand, but I've decided it's worth investing the money I'd usually spend on lots of drugstore items into less, higher quality skincare bits that will get everything back to tip top condition and hopefully keep it that way. I'm very impressed with my dabble into REN territory and it's safe to say all these bottles have earned a permanent place on my skincare shelf. Lucky them. What would you recommend from the REN range? Ooh this sounds like such a good range, I've never tried REN but I hate when spot fighting products leave your skin dry and stripped so these sounds perfect.